Analytics is required to measure the success of your seo or sem campaign. Proper measurement and analysis helps to measure the return on investment. 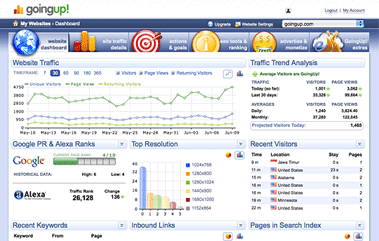 There are several free web analytics tools which you may use to measure the success of your campaigns. A free tool from the search engine giant, Google itself. This tool lets you measure the ROI and helps you to analyze the amount of visitors to your site, the geographical location of the visitors, the bounce rate, conversation tracking etc. Another free web analytics tool which produces usage statistics from the server logs. It provides recent visitor locations, recent visitors map, keyword research, heat maps, goal tracking etc. Clicky offers a free web analytics platform for single website. It is a real time analytics service. It allows you the view the history of individual pages of your website. It offers visitor segmentation and Twitter analytics. Another great website providing free hit counters and web stats. Great list of tools.Thanks for sharing them along with their links and description.Well everyone of us should use some user counter for our site or blog because it not only reports your traffic numbers, but also gives you valuable information that will help you understand the behavior of your site visitors better and so perform outstanding customer intelligence.Among them Gostats provides reliable statistics.Third party free online user counter are much easier to deal with and are more likely to offer a better website hit counting experience.